WEST HAVEN – Devil’s Bowl Speedway fans were witness to the latest shakeup in a series of back-and-forth swings for the asphalt track championship on Saturday night, Sept. 3. Jason Durgan, Josh Masterson, Austin McKiernan, and Zach Wood each picked up NASCAR Whelen All-American Series victories at the fast-paced event. Three of the night’s four feature races went flag-to-flag without incident, and only one caution flag slowed the other. Durgan was untouchable in the Sportsman Modified division’s caution-free 30-lap race. Aided by a low handicap and an up-front starting position after two poor performances in the last three events, the Morrisonville, N.Y., driver got out front early and was on virtual cruise control to sail to his fifth win of the year. Ron Proctor and Jimmy Ryan battled in the first half before Proctor was able to get by and eventually take the runner-up spot. Ryan held off a late-closing Vince Quenneville, Jr. through lapped traffic to take third place; Quenneville and Joey Roberts completed the top five finishers. The championship fight is likely to come down to the final lap of the Vermont 200 Weekend season finale on Sept. 10-11. Through qualifying heats and the main event on Saturday night, Durgan erased defending champ Quenneville’s seven-point advantage and the two drivers find themselves in an unofficial deadlock at 733 each with twin 50-lap features next weekend. Proctor is 42 points back in third and remains an outside threat. Josh Masterson of Bristol was a convincing winner in the non-stop 30-lapper for the Late Model division. Masterson scored his fifth win of the year and clinched the Winner’s Circle Challenge season bonus in the process. Robert Bryant, Jr. finished second, while Chris Bergeron held on to third place. Steve Miller and Seth Bridge ran 4-5. Masterson maintained the unofficial point lead entering the 100-lap finale at the Vermont 200 Weekend; Bryant rides in second place, but at just 20 points behind (650-630) is still very much in the hunt. Rookie Austin McKiernan of Moriah Center, N.Y. got his second win of the year and his career in the 20-lap Renegade feature. He held a good lead when the race’s only caution flag waved with two laps left, bunching the field for a restart; he successfully held off his father, Jim McKiernan, for the win. R.J. Germain was a strong third behind the McKiernan duo and ahead of Scott FitzGerald and 14-year-old rookie Alexis Aiken. Unofficially, Jim McKiernan climbed back on top of the Renegade standings by just two points over FitzGerald (702-700). The Renegade title will be decided with a 50-lap race next Sundayafternoon. Another rookie, Georgia, Vt.’s Zach Wood, rebounded from a big wreck last week to win the crash-free 15-lap race for the Mini Stocks. Wood overtook Garrett Given with five laps left to take the lead and earn his fourth win. Given tied his season-best effort as the runner-up, with Eric Messier third. Brad Bertrand and Andrew FitzGerald were next in line. Messier, a rookie, leads the championship standings with an unofficial margin of 31 points (712-681) on Bertrand, with a 25-lap finale to decide the title next Sunday. 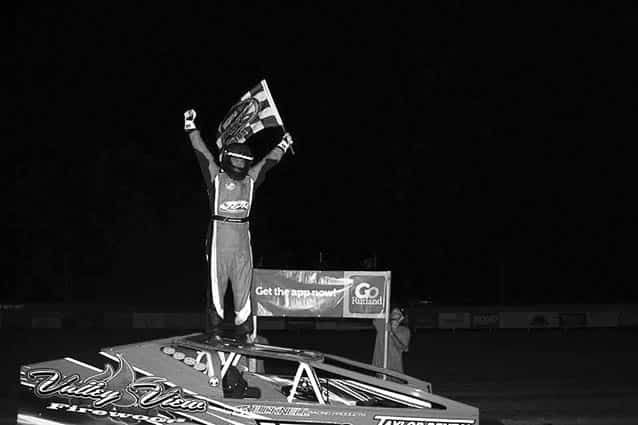 Devil’s Bowl is located on Route 22A in West Haven, Vt.
Jason Durgan of Morrisonville, N.Y., celebrates his Sportsman Modified win at the asphalt track at Devil’s Bowl Speedway. Does touching the sand incur a penalty?